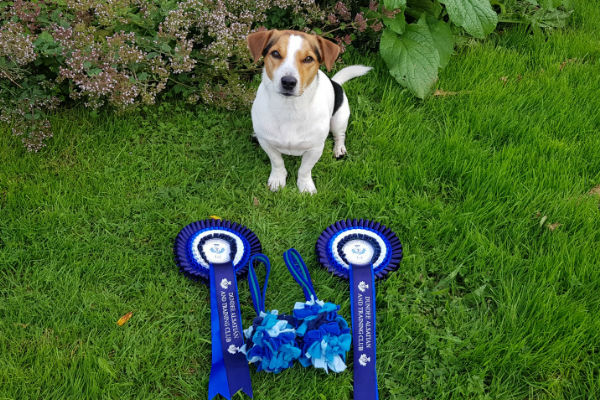 “We were competing at Dundee Alsatian and Training Club’s Agility Show at the weekend which was held at Glamis Castle near Forfar (new venue for the show, an amazing setting!). Buddy (my youngster) had a great weekend, winning his agility class on Saturday to take him up to Grade 5. To top off the weekend, he also won his class on the Sunday with a cracking run, winning by 8 seconds. Really pleased with his progress over the last 6 months, his confidence is coming on in leaps and bounds and his speed is increasing too, the Chapel Farm Performance 24+ certainly helps in that regard!! Thanks Melissa for advising of this latest success and our best wishes for future competitions with Buddy and Lottie.